Coffee is one magical flavor. But it’s also one that’s relatively easy to get wrong and one that usually takes a little time to acquire a taste for. But once you’ve acquired that taste, coffee will be a lifelong indulgence. It’s such an extraordinary flavor that when it’s mixed with chocolate (another of those magical tastes) it forms a new flavor, mocha. And mocha can accommodate a wide variety of other tastes and yet holds its own while enhancing that additional flavor. When an ejuice mixologist gets a coffee flavor right, and then adds chocolate to make mocha and yet another flavor, and manages to get all of them mixed well, that’s an ejuice worth savoring. Raspberry Mocha opens with a bold, dark roast espresso note. That’s quickly joined by a sweet raspberry syrup and light chocolate/mocha taste. The mocha and raspberry linger on the exhale. The vapor is rich and smooth and the throat hit is mild. The aroma is rich as well, with the slightly sweet raspberry riding on freshly brewed dark roast coffee. VaporFi Raspberry Mocha ejuice is dark, rich taste treat. The espresso note is especially full bodied, but not bitter as some other coffee ejuices I’ve tried have been. The raspberry, while not overpowering, manages to hold is own with those strong coffee and mocha notes. This is an almost decadent vape, rich, dark and just sweet enough to keep the espresso from becoming bitter. I’ve been vaping it for a couple of days and though it is very rich, I can’t seem to get enough of it. 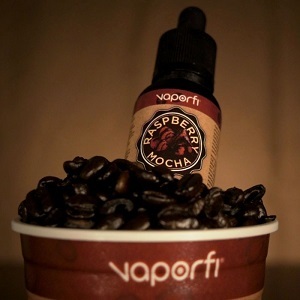 If you’re a coffee ejuice fan, especially if you favor flavored coffee vapes (or drinks), then Raspberry Mocha ejuice from VaporFi will be a favorite. VaporFi offers Raspberry Mocha ejuice in 30 ml glass dripper bottles for $17.99. Available nicotine levels are 0 MG, 3 MG, 6 MG and 12 MG. Raspberry Mocha is mixed in a PG/VG ratio of 30/70. I vaped VaporFi Raspberry Mocha in a SMOK TFV8 on a VaporFi VEX 150 TC. VaporFi provided the bottle of Raspberry Mocha I sampled for the purpose of this review. 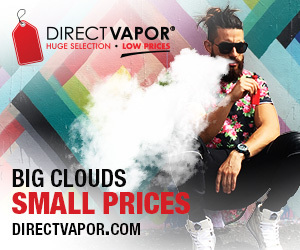 And VaporFi is a Seven Report advertiser. 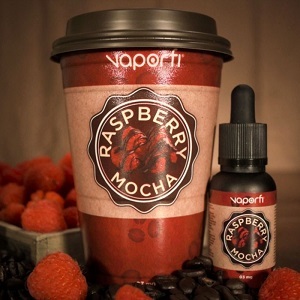 Order Raspberry Mocha ejuice from VaporFi.